Razer unveiled a new colour of their Razer Blade Stealth series, which is quartz pink. 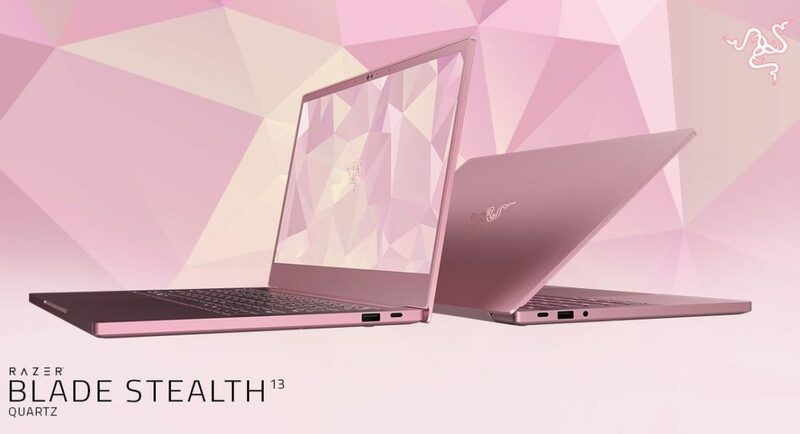 The limited-edition pink laptop comes days before Valentine’s Day. And not just the laptop, the company has also unveiled several of their gaming peripherals and products in quartz pink colour. Talking about the quartz colour scheme the company CEO Min-Liang Tan says that it will “steal hearts everywhere”. Will it be the gaming laptops aimed towards females only? The company hasn’t said anything about it, but it is being unveiled right before Valentine’s week says otherwise. According to the company it won’t charge extra for this limited-edition colour, it will be priced the same as the regular Razer Blade Stealth. Even the quartz pink peripherals will cost the same as the regular coloured hardware. Although, this is not the first time Razer has launched Quartz products. Last year they had launched four gaming laptops in the same colour scheme. But it’s different this time as the product which received the quartz colour treatment is far more extensive and wider. This year we have the Basilisk mouse, Kraken headset, Seiren X microphone, Huntsman keyboard and much more sporting this colour. These ‘different’ coloured products from Razer are very different than what the company is known for. All their products have that same expensive, high-end, black with green logo themed designs, and their products are all aimed for a specific crowd, but this year they have changed their image. Changing their product line-up colour doesn’t come in as a surprise though as last year the company did polls to ask in which colour the fans would like to see the next Razer products and Quartz Pink was the colour that won the poll. Say it with Quartz 💗 Take a fresh look at some of our best-performing hardware, now in a playful pink hue. Talking about the specs of this ultra-portable gaming laptop, it comes with a 13-inch Full HD (1920 x 1080) display with an 8th-gen Intel Core i7-8565U processor. It houses 16GB of 2,133MHz RAM and a 256GB SSD, Nvidia GeForce MX150 GPU along with integrated Intel Graphics module to handle any type of game. Its price in the market is $1,599 (approx. Rs 1,13,772). It looks similar to the Razer Blade laptop announced in December of 2018 which was later updated to the Razer Blade Stealth which was compact on design, had slimmer bezels and a bigger touchpad.